The final day of the 3 day workshop began with a look at the 2011 exam, my draft answers (since the rubrics have not yet officially been released by the College Board), and look at some notes from the reading. The notes from the reading proved to be very interesting, since the we had access to the latest updates from the CB on the new exam. We compared documents from June 2008 and much more recent, which tracked the discussions that have been taking place on the revised exam. The questions from the 2011 exam provoked lots of detailed conversation, including the concern over some apparent grading inconsistencies. Karen then showed as a super little demo/lab involving some old-fashioned flash bulbs and the calculation of the enthalpy of combustion of zirconium! Not something that is particularly common to say the least! Everyone was fascinated by it – great stuff. We then tidied up Kinetics (the fourth of ‘The Big Five‘) with a look at the ’09 question that asked for a fractional rate, and the discussions made me think about the question in a new light! THAT’S what professional development is all about – the exchange of ideas. We then moved on to the final topic in ‘The Big Five‘, Electrochemistry. Another simulation was on the table. 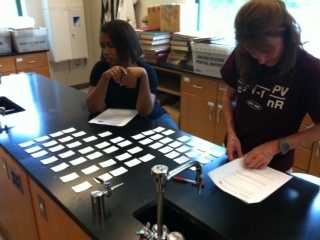 An early lunch was followed by a look at a Periodic Table activity and the deconstruction of the ’08 Practice Exam. A three day workshop that I enjoyed immensely, and it’s my sincere hop that that attendees felt the same way, but also took away some tremendously useful stuff from the meeting. Thanks to all for coming, and thanks to Andrea and Bob for facilitating – already looking forward to next year! 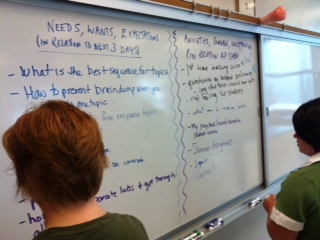 We started the morning by me working a couple of AP problems on the board; Q2 from ’07 and Q1 from ’98. The 2007 question is a Thermo problem and the 1998 question is a Ksp problem. This was really to provoke discussion about different ways of presenting material to kids, and I was hoping that it would provoke comments like, “Well that one way to do it by I like to do such and such…..”. The problems were selected to dovetail with the first two of ‘The Big Five‘ from yesterday. 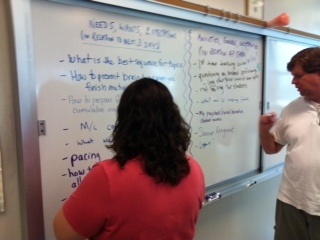 We then moved on to discuss one of my favorite areas; common misconceptions/problems/pet peeves in AP Chemistry. 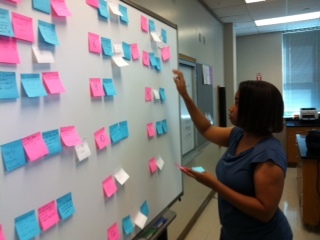 We started the mini-session by brainstorming on Post It notes using my 17 Topic headings. I wanted to come up with at least one common misconception/problem/pet peeve that the attendees had come across with their kids in each Topic area. This yielded some great information and some lively discussion. Having come up with our own lists we then compared them with the Common Misconception document that has been an amalgamation of thoughts from John Gelder (ex-chief examiner), myself, and respected, veteran AP Chemistry Teachers Mike Jones and Paul Cohen. This resulted in lots of head-nodding as we recognized some traits in out own students that hadn’t made the original, Post-It, brainstorm list. The afternoon session was made up of a look at the third and fourth of ‘The Big Five’, Acid Base & Kinetics including taking a look at a tricky Buffer problem from ’03. Both of these topics have associated simulations and we had a look at those, too. One of the interesting things that came up during the Buffer discussion was the use of a modified version of the Henderson-Hasselback equation which I am not in the habit of using, but still works well. It’s nice to see alternatives and have options when solving these problems – thanks, Kellie! I think we agreed that this is a simpler version of the regular HH equation, and to some students without such strong math backgrounds it can look muss less intimidating in the this, ‘unlogged’ format. The only drawback is that the students we need to memorize it since the ‘logged’ version appears on the data packet (formula sheet) that comes with the exam. A few more mystery door prizes rounded out the day! Here’s a quick summary of what we did today. 2. 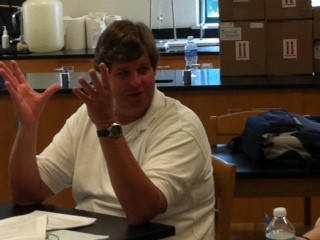 Anxieties, Uncertainties and Concerns about teaching AP Chemistry next year. I was hoping that #1 would inform ME about some of the direction that we might take over the course of the workshop, and that #2 would allow the workshop attendees to give each other some insight into their own strengths, weaknesses and backgrounds. I found it helpful, and I hope others did too. After the intro session I delivered my ‘keynote’ address! Ha, Ha! WOW, that sounds grand doesn’t it!? Well, it really isn’t but the 45 minute presentation called ‘Teaching AP Chemistry the English Way‘, gives crucial background to my ideas, and perhaps gives some method to my madness. As such it’s an important anchor for the three days. After break, as an introduction to Thermochemistry, Dana Isaac demoed a great, simple yet so effective lab for calculating a Delta H using two simple chemical reactions and some algebraic manipulation. Cheap, simple chemicals (Mg, HCl and MgO), great results and powerful chemistry – perfect. Following the lab demo we went ahead and took a look at the first two topics of what I call ‘The Big Five‘ – Thermochemistry & Equilibrium. A break down of my notes, worksheets and discussions about how the materials for those topics are used, was followed by a quick look at a very, very, very simple but effective Le Chatelier computer simulation that I am fond of. NO frills here, but understanding for the kids seems to be enhanced each time I use it. We concluded the day by ‘deconstructing’* the 2002 multiple-choice exam, and seeing a quick REDOX demo invloving CuCl2 and Al from Jeff, where we discussed a number of possible ways of extending it to teach more than one topic. *In deconstructing the MCQ exam we don’t actually answer ANY of the questions! Rather we look at each question and search for insight, clues, triggers, distractors and other data that may serve to inform the students even BEFORE they read (or even attempt to answer) the questions. Quite a few ‘freebies’ given away today, too, so a successful Day 1 I think. I hope the attendees agree! I’ll be tweeting during the workshop and hope others will join in the conversation. The hash tag is #cftapc11. I hope we can get some good dialogue. Amongst many other things, here are a few topic headings to whet your appetite for the workshop next week.